The Cradlepoint COR IBR600 Series is built for your M2M network. The COR IBR600 Series is an affordable, highly featured compact router with an embedded modem designed for critical business and enterprise applications that require 24/7 connectivity. With its compact size, sleek metal case, mounting bracket, and external mobile broad-band and WiFi* (IBR600 only) antennas, the Cradlepoint COR IBR600 Series is ideal for use in high-availability portable or fixed applications like ATMs, kiosks, surveillance, vehicles, etc. Cradlepoint COR provides instant network connectivity with a built-in modem—just add a mobile broadband plan or insert an activated SIM (2FF) and go. It also supports traditional wired data networks like DSL, cable, or T1 for maximum network flexibility. Business-continuity features like failover/ failback come standard in Cradlepoint COR. When configured for failover, COR detects network failures and seam-lessly switches over to a secondary WAN—keeping your network online. The Cradlepoint COR IBR600 Series provides VPN end-point functionality, VLAN support, IPv6 support, multiple remote management methods including SMS, modem data usage management and alerts, GPIO support, USB-to-serial console passthrough support for out-of-band management of connected devices, and the ability to be part of a PCI-DSS compliant solution. It allows for secure access to company networks for enterprise applications and provides a secure way to transmit sensitive data to and from a remote site. Keep your vehicles, machines, and IoT networks connected and cloud-managed 24/7 with the Cradlepoint COR Series, the most reliable, capable, and rugged routers in the industry. 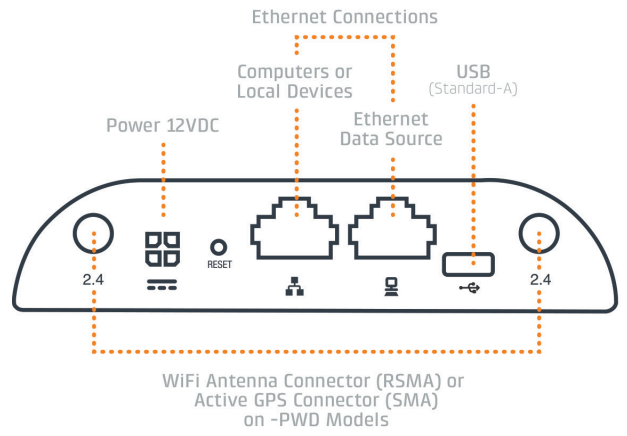 Purpose-built for the most demanding M2M / IoT and mobile in-vehicle connectivity. Fully integrated with Cradlepoint NetCloud Platform for cloud management and virtual cloud networking. Supported by Cradlepoint Extensibility Platform & SDK to enable an infinite set of applications and capabilities. Extensibility Dock for second modem, more ports, etc. 1 Enterprise Cloud Manager requires a subscription. 3 Native support for authentication. Authorization and accounting support through hotspot/captive portal services. COR IBR600/IBR650 models include an integrated 4G LTE or HSPA+ or LTE/HSPA+/EVDO modem – specific model names include a specific modem (e.g., the COR IBR650LPE-VZ includes a Verizon LTE modem). 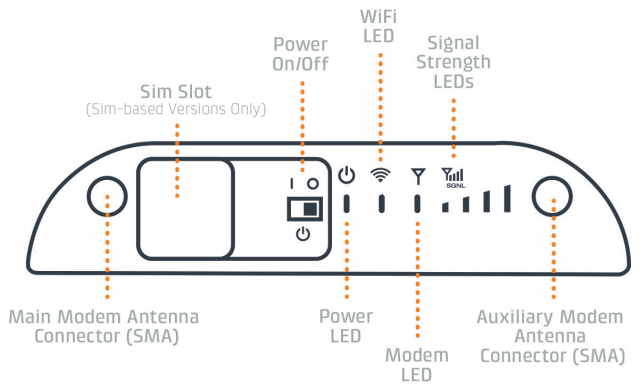 Cradlepoint products with the -EU and -INTL SKUs enable and disable WiFi channels to comply with EU law. The -EU and -INTL SKUs are not legal for use in North America. The -EU and -INTL versions come with an adapter kit for non-USA/Canada power outlets (includes US, EU, and UK options). The IBR600 is configured with an internal modem already. No external modem is required. Cradlepoint’s NetCloud platform combines industry-leading router firmware, award-winning Enterprise Cloud Manager, and the new NetCloud Engine network-as-a-service. 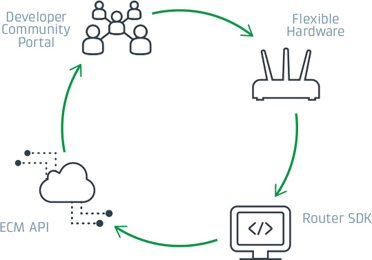 This integrated platform of flexible, extensible, and rapidly deployable applications enables an entirely new way to easily build, secure, control, and manage end-to-end private networks in the cloud using wired and wireless broadband Internet services. 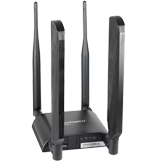 Firmware is the heart of our industry leading LTE routers. Sustained commitment to new features and capabilities ensures your network is always up to date and secure. Cloud Management Service that enables zero-touch deployment, remote management, alerting, and analytics of in-vehicle routers and IoT gateways. NetCloud Engine enables virtual cloud networking that leverages cloud, Software-Defined Networking (SDN), and Network Function Virtualization (NFV) technologies. Extend select Cradlepoint COR Family routers with an additional modem, additional Ethernet ports, and more general purpose input/outputs (GPIOs). Developer Community to leverage knowledge, share, and collaborate with other developers—for a one stop shop. Keep machines connected 24x7 with Cradlepoint COR, the industry's most reliable solution for M2M/IoT and Transportation networking.